You’ve gone through straighter after straighter trying to tame those beautiful, but sometimes frustrating curls. You love your locks and would never want to permanently be rid of them, but all you really wish for is just one straighter than can help give you the sleek look of straight hair that everyone else has. So just what is the best hair straightener for thick, curly hair? How do you find this magical straightener? I’ve listed 10 of the best hair straighteners for curly hair and some of their key features in the table below. Is it possible to permanently straighten hair from home? The BaBylissPro Nano Titanium is a premium straightener that offers tremendous value compared to other options for your hair straightening needs. With ultra-thin titanium plates, the BaBylissPro Nano is the best straightener for thick, curly hair. The ceramic plates are able to straighten out your curls quickly without pulling your hair. The plates are smooth, leaving your hair feeling silky soft and looking frizz free. The BaByliss Pro plates come in three different sizes; 1”, 1.5” and 2”. The plates also do not easily corrode. The BaByliss Pro has 50 different types of heat settings, going all the way up to 450 F degrees. The straightener has a ceramic heater, so it heats up immediately. The straightener is lightweight and easy to handle. With the ryton housing, you will never have to worry about burning your hand when handling the straightener. I enjoy how quickly I can straighten out my curls with this straightener. I set the heat to the max of 450 F degrees when using it and only have to go over my hair one time in order to make it straight. I’m always impressed by how quickly it heats up. I turn it on and within a couple minutes I can begin straightening my curls out. This straightener is nice to use because the ceramic plates never pull on the strands of my hair. When I finish straightening it, my hair looks shiny instead of frizzy and feels very soft and smooth. The BaBybliss Pro does great at straightening out curls because of how hot the temperature can go. Without an automatic shut off though, if left plugged in and forgotten, it could cause an accident. This sleek, black flat iron will leave your hair straight for hours on end with its advanced technology. Many straighteners have to be held on your hair for seconds at a time in order to straighten the hair, resulting in heat damage. The HIS Professional Glider has 8 HeatBalance micro sensors in it though that help prevent your hair from the possibility of heat damage. The sensors are able to monitor how hot the iron is, letting the heat distribute equally over your hair as you straighten it. The glider leaves your hair looking healthy thanks to the ceramic and tourmaline crystal ion plates. This straightener allows you to spend less time holding the iron on your hair, while still leaving it looking straight as can be. The HSI has adjustable heat settings. The temperature settings range from 140 F degrees to 450 F degrees. This range allows you to create the flawless look of both shiny and soft. When you adjust your temperature, you will reduce any possibility of your hair looking frizzy. The HSI has worldwide dual voltage. This perk allows you to take it with you even when you travel out of the country. The voltage is compatible with 110v – 220v. The HSI’s unique gliders are very efficient in how quickly they can straighten my hair, while also leaving no trace of heat damage. My hair stays straight even after sleeping on it, which is a nice plus, saving me more time in the mornings to get ready. I travel out of the country at least a couple times throughout the year and the dual voltage is one of my favorite features about the HSI. The 360-degree swivel cord allows me to reach the very back of my hair, without pulling any of my strands. This iron also comes with an HSI style guide, a bottle of Argan oil treatment and a 1-year warranty. The ability to use the straightener out of the country is great, however if you travel frequently, the swivel cord may wear down quicker. You need to be careful in how you wrap it when packing it in your luggage. 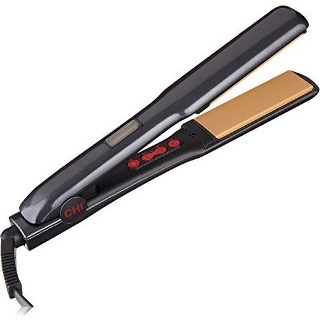 Another model in the lineup of straighteners is the popular brand, CHI. Like the CHI’s other models, the G2 creates a beautiful, sleek look in no time. 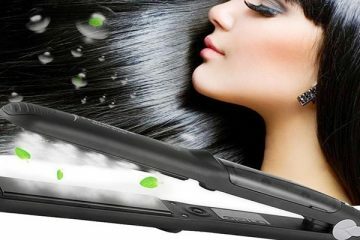 The G2 comes with some of the most advanced technology for a hair straightener though, outdoing the CHI’s former models. The G2 is designed with 1.25” titanium infused ceramic plates that glide through your hair, leaving it looking glossy. The titanium plates are long lasting and very stable. The color-coded digital heat settings set this flat iron apart from others. 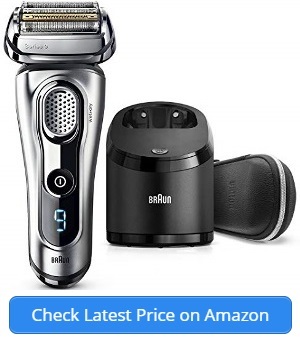 This digital LED display not only recommends a temperature setting for your type of hair, but when heated, it lights up a specific color to let you know it is ready. There are three settings to choose from. Blue is for fine or fragile hair (0-370 F degrees). Green is for medium or wavy hair (375-395 F degrees). Red for is coarse or resistant hair (400-425 F degrees). The G2 comes with a red thermal mat for packing the CHI in and a 2-year warranty. The recommended color-coded heat presets are a really nice feature to have. My hair is long and very coarse on top of being curly. I use the red preset as suggested and my hair is straight as a board every time. I have had this CHI for years and it has experienced a few drops but has held up wonderfully. The plates are extremely durable. The G2 Is also dual voltage making it great for traveling out of the country. The thermal mat is a lifesaver as sometimes I have used the CHI in the morning to get ready before I travel, and it is still hot when I need to leave. I just wrap the straightener up in the mat and it prevents it from burning through any of my belongings in my suitcase. I do have to wait a few minutes for it to heat up before using in order to make my hair completely straight. The G2 does get extremely hot on the red setting. It is important to be cautious when grabbing it or even holding it for extended amounts of time. The outside can get pretty hot, too. This fun looking model not only straightens your hair, but moisturizes it, too. The KIPOZI Pro comes in three different colors; pink, gold and black. With far-infrared technology and a superior PTC ceramic heater, this flat iron lets out negative ions onto your hair when straightening. The ions provide moisture to your hair and leave it looking sleek, reducing any trace of the frizzy curls you had before. The adjustable heat makes this flat iron perfect for all kinds of hair types. There are three heat settings to choose from. The KIPOZI also has a LCD digital display. This display will show each of the above heat settings (fragile, damaged and healthy) when choosing a temperature. The 3D plates are 1”. This width allows you to straighten any length of hair, while also being able to straighten your bangs safely. The flat iron has a built-in automatic safety feature that shuts the straightener off if left on for longer than 90 minutes. The KIPOZI is also worldwide dual voltage, compatible with 100V-240V. The straightener is truly ready to use within 30 seconds of being turned on. This saves me so much time when getting ready. I really enjoy how quickly it heats up. The straightener comes with a velvet bag to store it in when traveling. The look is great, while also being very functional for packing, taking up little room. The plates and cover are easy to clean and very durable. The swivel cord is 8 feet long which makes straightening my curls convenient in any room of my house. It also allows me to reach the curls in the very back. The KIPOZI does have an automatic shut off safety feature at the 90-minute mark, however it would be nice if there were two time limit options. My hair only takes 40 minutes to straighten sometimes. If there were a 45-minute option, that may be better. I still fear if a straighter was left on at the highest heat setting by mistake, that it could possibly result in an accident. 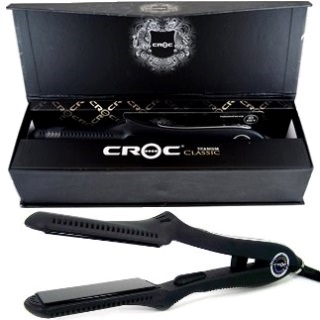 Next on the list is this unique shaped Croc Classic Nano-Titanium flat iron. The curved indention that separates the plates allows for a comfortable hand grip. This grip prevents you from burning your hands when holding the straightener. With its titanium ionic, ceramic plates that use far-infrared heat, the Croc Classic leaves even the curliest and thickest of hair looking shiny and straight. The temperature of the Croc is adjustable with 25 different settings to choose from. The temperature’s lowest setting is 200 F degrees and the highest is 450 F degrees. As the straightener heats up, the FND digital display shows you the current temperature as it climbs to the desired temperature. The temperature rises by 10 F degree increments. The Nano-silver technology in the Croc not only sterilizes the plates, but it also prevents the Croc from developing an odor. The flat iron does have an automatic shut off feature. It also comes in two patterns; classic and new classic. My hair is very curly and coarse. When I use the Croc, I can’t even feel it as I run it through my hair because it glides so smoothly. With most flat irons, I have to use the maximum heat setting. I was shocked to discover that I can use the Croc at an average temperature and my hair still turns out straight as can be. It also heats up very quickly, no matter what setting you adjust it to. The iron itself is very lightweight. My hand never cramps up when using it. The shape of the Croc is also very nice. I’ve never once burned my hand or even come close to it due to the unique shape. I did drop my first Croc once. It didn’t fall extremely hard, but hard enough that it cracked the plate. It does come with a 1-year warranty though, so if you drop it within that year, they send you a replacement one if it does break. I would be careful about dropping it after the year mark, as the plates seem fairly fragile. The Xtava Infrared flat iron has the perfect combination of features to qualify it as one of the best straighteners for curly hair. The floating plates of the Xtava are extra wide, 2” to be exact. They are made from ceramic tourmaline to reduce frizzy hair and create a sleek and shiny appearance. With the use of the infrared technology, the floating plates release the heat onto your hair in a way that prevents it from being damaged. This special technology draws the oils out of the hair shaft and provides moisture to your hair. 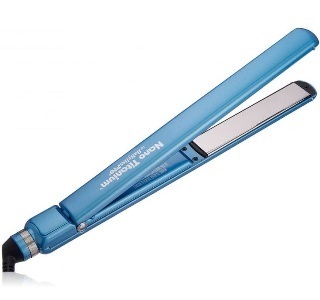 No matter how humid it is, your hair will still look great when using this flat iron. 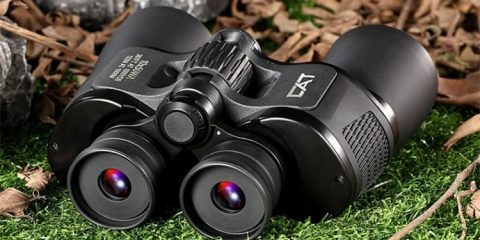 The Xtava has 10 temperature options to choose from. These options can be seen on the LCD digital display. The heat ranges from 265 F degrees to 445 F degrees. There are three recommended heat ranges for delicate, normal and thick/coarse hair. 265°F – 300°F for fine delicate hair. 300°F – 380°F for normal hair. 380°F – 445°F for thick/coarse hair. It has an automatic shut off feature that will kick in after 60 minutes of being on. It also has a special lock feature that you can use by simply double clicking the power button. 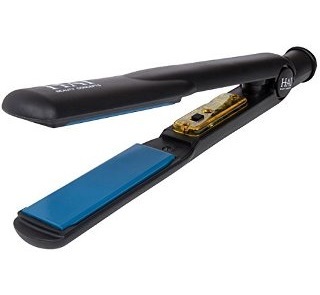 This flat iron comes with a convenient heat resistant travel case and dual voltage plug. It also comes with a 2-year warranty and a money back guarantee. The Xtava heats up within 90 seconds of being turned on which is a nice feature to have when it takes up to an hour to straighten my hair sometimes. I use the heat setting recommended for thick or coarse hair since mine is both of those. This setting always leaves my hair looking glossy and straight. It never pulls or tugs on my hair as I go over it and never leaves it looking fried. It does have an 8-foot swivel cord which makes reaching the back of my curls easy to do. The 360-degree swivel cord never tangles and is easy to pack and take when traveling. Though it does come with a dual voltage plug, I had an issue with my first one. I sent it back though and they replaced it with a new one. I have yet to test it out. 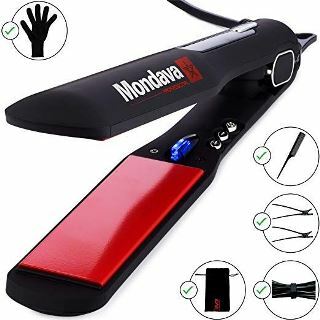 The Mondava Professional is the complete package when looking for a straightener that will tame your curly locks. This straightener has 1 ¼” plates made of ceramic. These ceramic plates create a beautiful, sleek look as they smoothly glide through your hair as you straighten. The Mondava uses tourmaline and ionic technology to promote healthy hair by nourishing it while you straighten. The tourmaline ensures that the heat is equally dispersed throughout the hair. It also secures moisture into your hair, providing a nice glossy, shine. As you straighten your hair, this technology also helps to detangle it. You can adjust the temperature from 180 F degrees to 450 F degrees. The digital control allows you to view what the temperature is at. 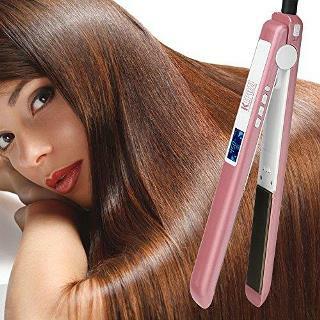 This flat iron heats up within 5 seconds and has an automatic shut off feature for safety purposes. It also has a dual voltage compatibility of 110V – 240V. The lock feature on this straightener is very convenient. When I’m done using it, I simply hold it together and click the lock button, making it easy to store away. The ceramic plates glide through my hair really smoothly which isn’t always easy to do with curls as thick as mine. I expected some pulling at first, but I never feel anything. My hair looks very healthy after using the Mondava. It has a shine to it, that other straighteners don’t leave. Aside from the straightener and travel bag, you also get a salon styling comb, a heat resistant glove, 2 alligator clips and a Velcro cord strap to easily bind your swivel cord in when traveling. There really isn’t much that could improve about this flat iron. My only desire would be if it could come in a different color other than just black with red plates. This hair straightener comes with all the important features you need for achieving the beautiful, sleek look you desire for your curls. The adjustable temperature reaches a max of 450 F degrees. The option for minimum heat is 250 F degrees. The adjustable heat settings prevent your hair from being damaged as you customize what heat level you need for your specific hair type. There are 4 recommended heat settings for certain kinds of hair. 450 F degrees for thick, curly or wavy hair. 355 F degrees for normal or somewhat curly hair. 320 F degrees for dark colored or dyed hair. 250 F degrees for bleached, thin or fine hair. The FURIDEN is made with ceramic floating plates that smoothly slide over your hair as you straighten it. It prevents frizz on even the curliest of heads. These plates keep your hair straight all day long, despite the humid weather. These floating plates refrain from pulling strands of your hair as you straighten. The unique barrel like shape of this straightener doubles as a 2 in 1 tool. It is both a straightener and a curling iron. 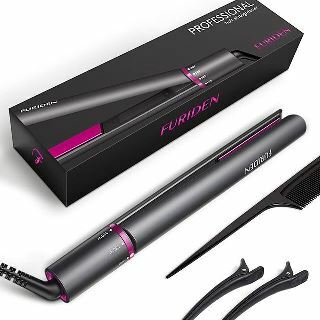 The Furiden is a great travel straightener with its worldwide dual voltage, compatible with 110AC-240AC. No matter where you go, you’ll be able to always take this straightener with you. The automatic shut off ensures your safety. You’ll never have to worry about a fire occurring if you happen to forget to turn it off when finished using it. 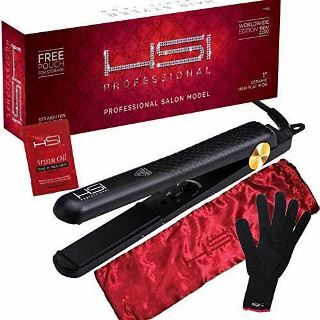 Along with the straightener, you also receive a travel flat iron bag, a salon comb, 2 salon quality hair clips and a durable heat resistant glove. I really enjoy the dual use of this straightener. My natural curls are really tight, so it is nice to be able to straighten my hair for work, then put some soft curls in it when I go out with friends in the evening. The heat resistant glove is very handy as the FURIDEN does get extremely hot. I tried using it without the glove one time and I could easily feel the straightener burning my hand. This straightener also has an extra-long 360-degree swivel cord, 97” to be exact. I can easily walk from one end of the bathroom to the other in order to grab something while continuing to straighten my hair. The swivel allows me to naturally move to reach angles of my hair that are otherwise hard to reach. The flat iron heats up within 20 seconds, making it quick and easy to get ready for work in the mornings. The straightener does come with a travel bag, but because of how hot the FURIDEN gets, it’s best to let it cool before packing it in this bag. I purchased a separate heat resistant case for it so I can pack it up immediately after using if I am in a rush when traveling. The HAI Classic is exactly that, a classic. Simple in appearance, this straightener has all the best features. The 1.25” ceramic plates are blue in color and created with the latest heating technology. With the advanced heating technology, the HAI heats up quickly and has instant recovery. The instant recovery leaves your hair looking sleek and straight after just one round of straightening. The size of the plates, along with its beveled edges also allow you to not only straighten but curl your hair as well. There is an analog heat control that offers different temperature settings. 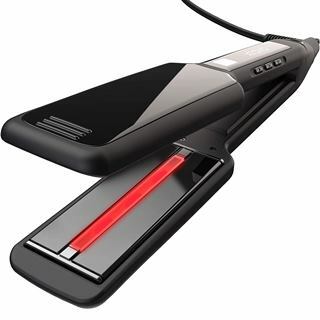 When the straightener reaches the desired temperature, the red light will flash to let you know it is ready to use. There are three temperature recommendations for different kinds of hair. 250°F – 350° for fine hair. 360°F – 400° for average hair. 400 – 410°F for multi-textured hair. The HAI is a very durable straightener and can last years on end. There is an option to purchase either a 2-year warranty or a 3-year warranty. Each time I use this straightener, I am impressed. It only reaches a maximum temperature of 410 F degrees, but I am still able to completely straighten my thick, curly hair at this heat level. With other straighteners, I have to go over my hair at least twice to fully straighten it. When I use the HAI, I only have to go over my hair once to achieve this look. This is definitely a time saver. My hair has actually become healthier looking since using this straightener because of this. Unfortunately, the HAI is not dual voltage, so it is not very travel friendly. You can purchase an adapter and try it, but I have yet to test this out. 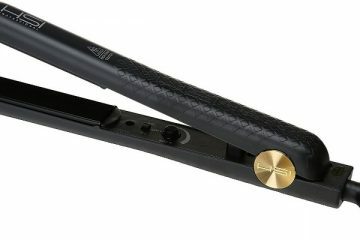 The classic, black appearance of the Paul Mitchell flat iron seems basic, but with its efficient ceramic plates, this iron is one of the best straighteners for thick, curly hair. The Paul Mitchell Pro gently slides through your hair. The plates on the Pail Mitchell have beveled edges, preventing the hair from becoming damaged. It does not pull or tug on your strands, leaving your hair looking smooth and polished. The ceramic plates are 1.25” and are well cushioned. This flat iron also uses Express Ion Complex technology to keep your hair looking healthy. The plates are able to reach a temperature of 410 F degrees in only 60 seconds. The extremely quick heat up makes getting ready very convenient. I can use the heat on the maximum level and my hair never looks damaged or fried. The ceramic plates feel really smooth on my hair as I go over it. The beveled edges are a nice touch. I never have to worry about catching a strand or pulling out pieces of hair, no matter how fast I straighten my hair. Though it’s more basic in appearance, it still comes with a long 360-degree swivel cord as well as a automatic shut off safety feature. I do wish the style of the straightener was more elegant in appearance. Also, this straightener gets really hot, so sometimes if you hold it for seconds at a time, you may feel a burning sensation. A heat resistant glove to use would be nice to have. Not all hair is the same. Some hair is thin and fragile, while other hair is coarse and thick. To provide the best care for your hair and prevent it from becoming damaged, you need to be able to control what temperature you use to straighten your hair. For thick, curly hair, a straightener that reaches a maximum heat of 450 F degrees is best. Straightening your own hair can be difficult at times. Pieces of the hair in the back may be hard to reach. A straightener with a 360-degree swivel cord allows you to reach those pieces at any angle. A cord that swivels will also refrain from becoming tangled or knotted. Straighteners reach very high temperatures. If forgotten on and left for a long period of time, the straightener could result in an accident such as a house fire. To prevent an accident from happening, purchasing a straightener that has an automatic shut off is very important. This safety feature could be a life changer. 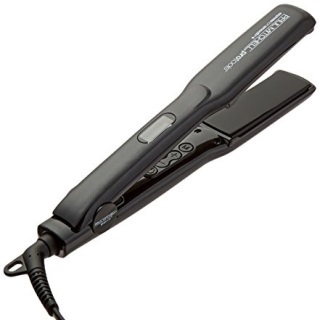 Many flat irons are created with dual voltage compatibility, but not all are. It is important to check to see if the straightener you are purchasing has this feature. If it does not, the straightener will not work if you travel outside of the country. You’ll be sure to want to take your straightener with you when you do travel so that you can always look your best. The best straighteners are designed with ceramic tourmaline plates. The ceramic allows the straightener to effortlessly glide through your hair, not pulling or tugging on any of your strands. Tourmaline plates not only straighten your hair better, but they leave your hear looking shiny and smooth. Tourmaline plates are created to moisturize your hair as you straighten, preventing it from drying out. Not all straighteners come with a digital display. You will be able to see exactly how hot your straightener is though by purchasing one with this feature. Some straighteners take longer than others to heat up, so knowing when your straightener is ready to use is easy to do by checking the digital display. Extensive use of a heat iron can cause damage to hair. You may be worried that by using a straightener on your thick, curly hair, you will damage the ends of it. If you follow these 10 guidelines though, you can protect your hair from damage. Step-1: Prepare your hair by washing it with a Keratin shampoo & conditioner. Keratin is known to not only make your hair shiny, but to make it feel smooth as well. By smoothing out your hair before you straighten it, your hair will not dry out. Conditioning your hair is important to do because it moisturizes your hair. A quality Keratin shampoo and conditioner can make a huge difference in the health of your hair. The Keratin Complex Color Care Shampoo and Conditioner are great for color treated hair, providing moisture on each strand. Step-2: Apply a heat protectant to Hair. It’s not news that flat irons reach extremely hot temperatures. Without some kind of heat protectant, even the best straighteners can cause damage if used too often. Using HSI’s Top 5 Salon Formula will help to protect your hair from the extreme heat. This easy to use spray is infused with natural ingredients such as Moroccan Argan oil and Aloe Vera, keeping your hair shiny and strong. When you section your hair, you’re not only saving time, but you’re also creating a better look. The amount of time it takes to straighten hair when you leave all of your hair down and try to straighten it by just grabbing chunks is much longer than when you divide it into sections. The heat is not fully applied to all of your hair when using that method. You’ll become aggravated and probably still end up with wavy hair, at best. Using these lightweight, wide toothed Xtava Styling Hair Clips will make straightening hair fly by. If you straighten your hair often, I recommend you use the ceramic plated, HSI Professional Glider. It has microsensors to monitor the heat, preventing your hair from damage. Ceramic plated flat irons are important to use because they protect your hair from the high heat that is applied. The tourmaline plates are even better to use because they help keep your hair looking healthy and smooth. The more times you go over your hair with a flat iron, the more you are exposing your delicate hair to high levels of extreme heat. It’s vital to choose a straightener that can quickly straighten your hair by only going over it once. The CHI G2 ceramic iron is a great iron for efficient straightening. Step-6: Going on vacation? Your straightener goes to! Who doesn’t want to have beautiful hair everywhere they go? Whether it’s once a year or once every few years, when you travel out of the country, you’ll want to remember your flat iron. Purchasing a straightener like the KIPOZI Pro Flat Iron that has dual voltage, so you can use it no matter what part of the world you’re in. Whether you straighten your hair often or once every couple of months, it’s important to keep your hair restored. A simple coconut oil treatment can work wonders for dry or damaged hair. This Coconut Oil for Hair & Skin by COCO&CO is made with pure organic extra virgin coconut oil to leave your hair looking fuller and shinier! It may take a while to blow dry your curls. To give your hair a break from all the heat, try air drying your hair once or twice a week with a towel made from natural products such as bamboo. Made with 70% bamboo, this Texere Women’s Bamboo Viscose Hair Towel not only helps prevent split ends, but it also dries your hair faster. A good blow dryer can be the difference in a head full of frizzy hair vs. a head full of soft, smooth hair. If your blow dryer tends to leave your hair frizzy, opt for using one such as the Revlon 1875W Frizz Fighter. The smoothing concentrator helps to tame down your frizzy hair, giving you head full of smooth, soft hair. Blow drying can be just as harsh on your hair as straightening can. If you use the correct brush though, you can help prevent your blow dryer from damaging your hair. When combined with blow drying, a flat brush can actually harm your hair. Use a sturdy, round brush like this Natural Boar Brush to allow more airflow and less hair pulling. Having your hair permanently straightened at a salon can be very costly. However, there is a way you can straighten your curls permanently from the comfort of your home. To permanently straighten your curly hair, you can use Keratin products. A popular Keratin product called Coppola Keratin Complex is simple to use. Your hair will remain permanently straight for 3-4 months after using the Coppola Keratin Complex. The process to straighten your hair with this product is very similar to the process used to color hair. You can see from the steps below just how easy it is to permanently straighten your hair at home. Apply the Keratin to your hair and use a comb to spread it equally throughout your hair. Make sure you have gloves on to do this. Put a towel under your hair to prevent stains to your clothes. The fumes of the Keratin can be strong, so make sure you are in a well-ventilated room. Let the Keratin sit for 30 minutes and then blow dry your hair. To make sure your hair absorbs the Keratin, go over each section with a straightener. Let the Keratin remain on your hair for 72 hours. Do not wash until after the 72 hours. Depending on how curly your hair is, straighten your hair several times during the 72 hours to help the hair absorb the Keratin and become straighter. Leave hair down during the 72 hours. To keep your hair straight for a longer period of time, use a sulfate free shampoo. Curly hair is beautiful, but sometimes the option to wear it straight is nice too. Finding a straightener that can tame your thick, curly locks is not an easy task though. To fully straighten out your curls, you need high heat temperatures that will leave your hair looking healthy instead of fried. A straightener such as the BaByliss Pro that reaches 450 F degrees, with a swivel cord is ideal to reach the curls in the very back, making sure they stay straight for the entire day.